What's with the Shark Fin? That seems to be a pretty much universal question the first time someone picks up a Boulevard Bourbon. Turns out, it's a belt and belt buckle, not a sharks fin, although it takes a while to figure it out. But wait, on second glance, there is a sharks fin too... Why Buneman and Martinoni chose this particular design is anyone's guess. Henry Buneman & Emilio Martinoni were in partnership for a number of years. They first appear as a partnership in the SF Directory of 1879. Mention of the partnership last appears in the SF Directory of 1895. Their location remained same for the entire duration of their partnership; the "NW corner of Clay & Front". 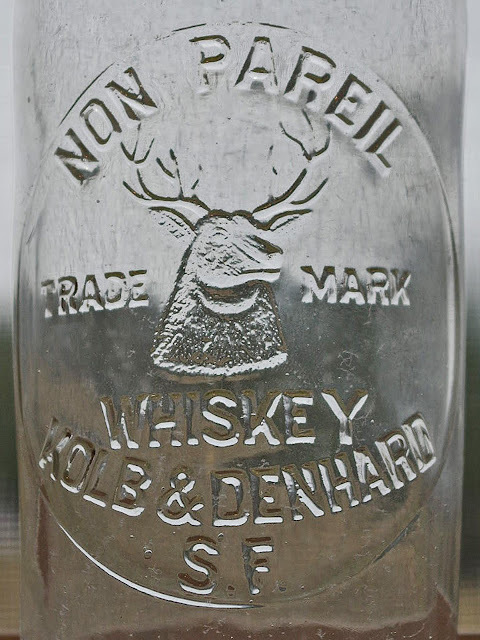 The first embossed bottle that they had blown for the brand is a clear "German Connection" fifth. This would date the first Boulevards to the ca. 1890 - 1892 era. Why they waited 21 years to have the first mold cut is anyone's guess. I can just imagine what an amber glop top mold, dating to the late 70's / early 80's for Boulevard Bourbon, could have looked like. 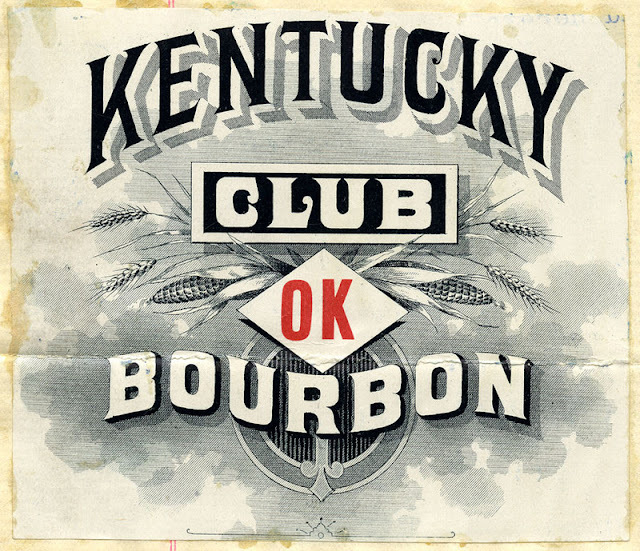 Research of the California State archives for trademarks failed to turn up any registration of Boulevard Bourbon. The last listing for the partnership is in the SF Directory of 1895. There is no longer a listing for "Buneman and Martinoni" in the 1896 directory. What does appear is a listing for E. Martinoni, wholesale dealer in wines and liquors. And another listing for H. Buneman wholesale dealer in wines and liquors. And so, somewhere toward the tail end of 1895 they separated and went their own ways, both pursuing what they knew best, the wholesale liquor trade. On February 12, 1897, Emilio Martinoni registered two brands of Kentucky Club Whiskey with the State of California; OK and AA. 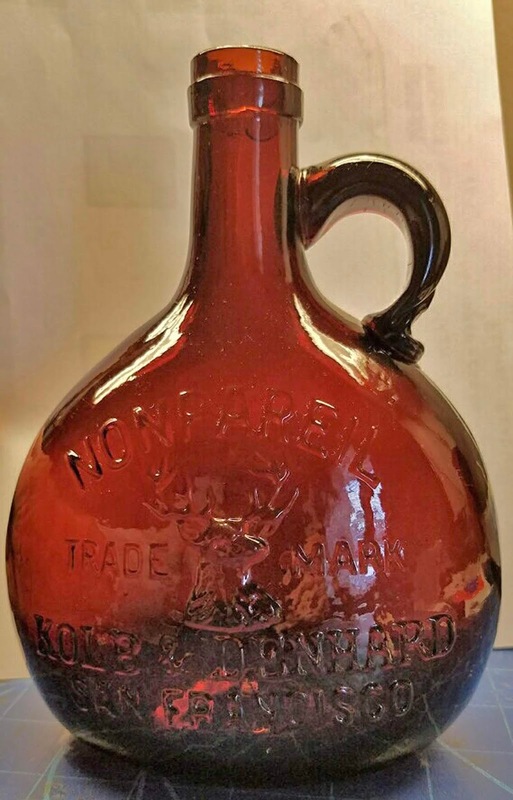 No embossed examples of this bottle have been found to date so we can assume that he opted to forgo the expense of having a mold made, and just bottled and sold the product in paper labeled slicks. Getting back to Buneman, as stated, he appears in the 1896 directory flying solo with the Boulevard brand. There is no longer any listing for H. Buneman Wholesale Liquors in the 1897 directory. Instead, the directory lists "the estate of Henry Buneman". My guess is that the Buneman and Martinoni partnership was dissolved due to failing health on Buneman's part. Albert Buneman, Henry's son, is listed as executor for the estate. In 1898, the listing changes again, this time Henry Buneman, estate of, wholesale wines and liquors. This listing remains constant through the 1904 directory. In 1905, the name of the firm changes to Buneman Mercantile. A third mold was cut for the Boulevard brand. This time reading, Boulevard Bourbon / Buneman Mercantile Co. / Sole Agents / SF Cal. The belt and "shark fin" were omitted this time around. The firm was located at 317 - 319 Front St., in the heart of the liquor district. Who was Buneman Mercantile? Would you believe, N. Grange, president and treasurer?!!! Unfortunately, Granges timing couldn't have been worse. They'd no sooner set up shop when 5:18 AM on April 18, 1906 rolled around (literally). Surprisingly, Buneman Mercantile was reorganized in the post Quake era of late 1906. It was incorporated as Buneman Mercantile Inc., moved to 1949 Market St., and continued on in the wholesale liquor trade for several more years. The last listing for the firm is in the 1916 SF Directory. No embossed bottles for the newly incorporated firm were produced, making the Buneman Mercantile Co. variant by for the rarest of the three embossed examples. Summing it up, the Boulevard Bourbon Brand had one heckuva run; first appearing in 1879 and winding down in 1916. A lifespan of 37 years, for any brand, by any stretch, was quite the feat in the dog eat dog world of the San Francisco wine and liquor wholesale trade of the late 19th, and early 20th century. Still, I can't help but wonder, what's with the sharks fin? The long and the short of it; (or the story of the Crown Cocktails fifth and the mini). Years ago, Wilson made mention of a product of the Crown Distilleries Co. which has baffled me ever since. 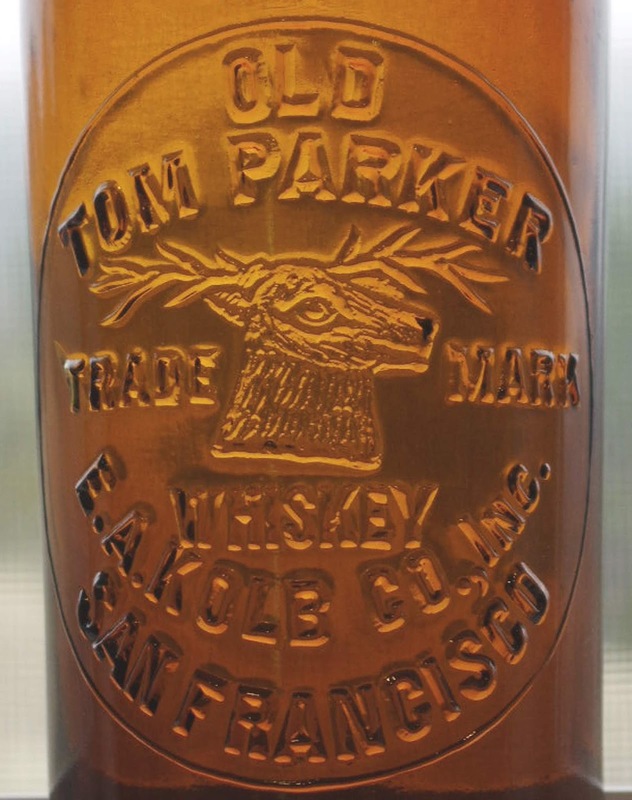 It's an amber cylinder embossed simply " Crown Cocktails / Ready to Drink". It was listed as an amber fifth, (no mention of whether it was glopped or tooled) #52-4 and he stated that it was common. Well, if it's so common, why have I only seen a scant handful in the ensuing fifty or so years? 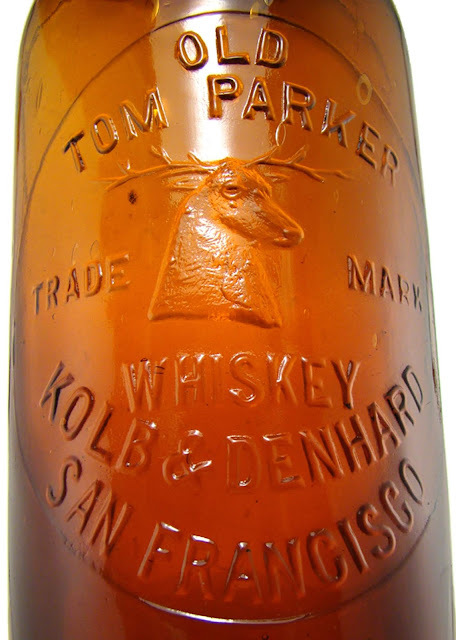 Later, Bob Barnett, in his Western Whiskey Bottles series, listed it as coming both with a glop and a tooled top. Bob dated it to ca. 1890 - 1910. The history of Crown Distilleries has been well documented by Russel Umbraco, a descendent of Ernest Reuben Lilienthal, who owned the company of which Crown Distilleries was spun off from. 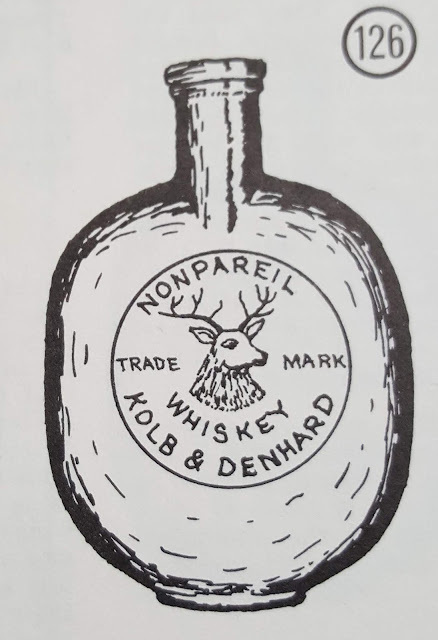 Russ stated that Lilienthal & Co.'s interests were so large and diverse, that the Crown Distilleries Co. was created in 1895 to handle Lilienthal's liquor interests. He further states that Crown Distilleries liquidated it's assets in 1917, due to the passage of the Volstead Act, and impending national prohibition. That narrows down the window for Crown Cocktails considerably. 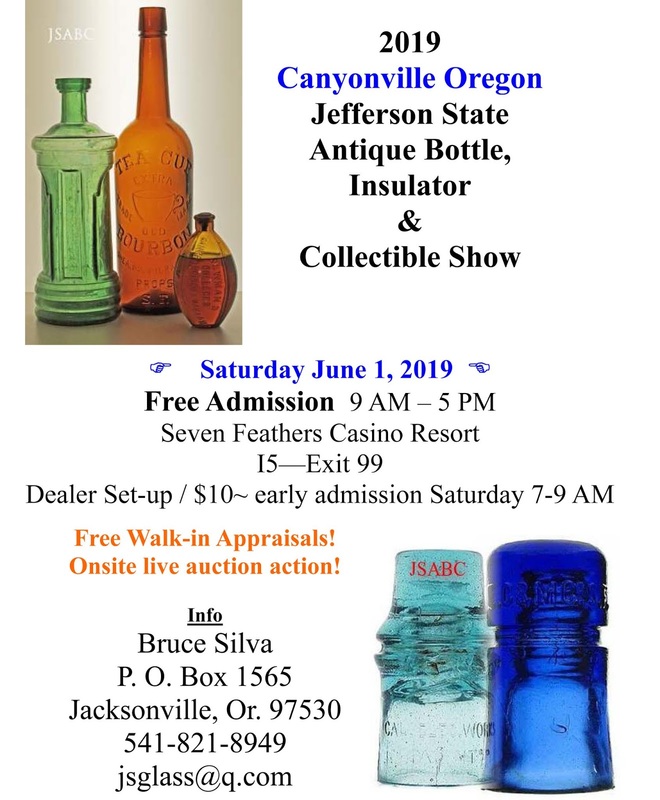 In as much as the bottle is scarce and that bottles were produced with both applied and tooled tops, I date it to the emergence of the CD Co., ca. 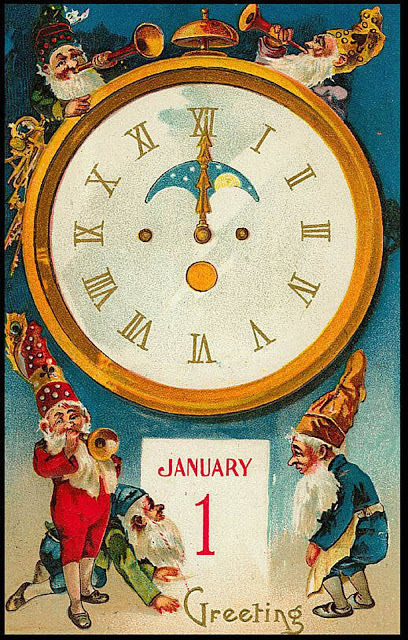 1895, as opposed to later. Extensive searches of newspaper archives and brand registrations were fruitless. It was never advertised and Crown Cocktails simply didn't make the cut. Based on the scarcity of the bottle, I'd say the brand flopped and was abandoned the same year it was introduced. Not mentioned in the Wilson or Barnett books is the presence of a sample (mini). 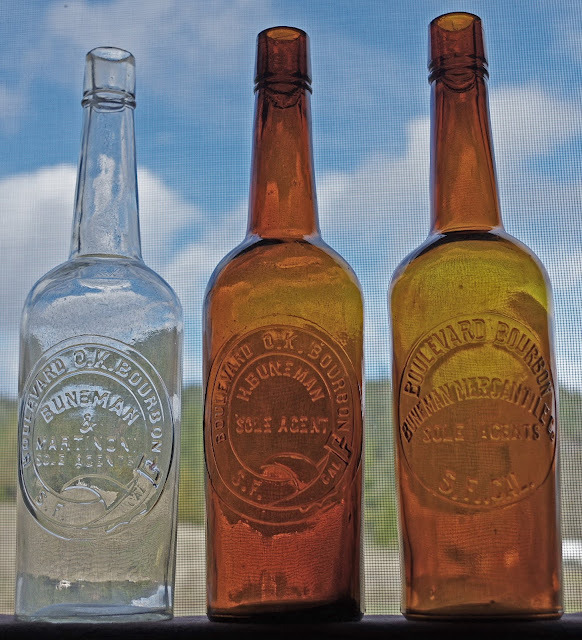 Crown Distilleries marketed railroad sample bottles which were used by the Southern Pacific Railroad; much like today's airline single serving bottles. They were embossed on one side, and had a paper label on the reverse. 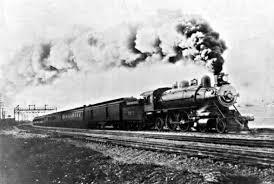 The brands were named after the passenger trains of the line; including Daylight, Flyer, Seashore Express, Shasta Express and a number of others. 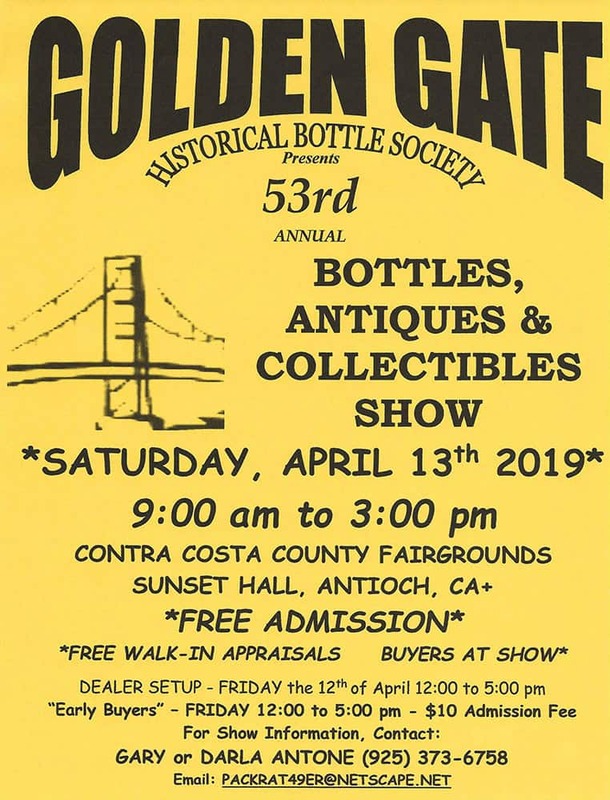 Fellow collector Mike Menze obtained a cache of these a number of years ago, which he liquidated at the Morro Bay Show. A number of different "sample" variants were produced including squats about 4 1/2" tall, larger examples around 5 3/4" tall, and a scarce shorter one with the embossing in a rectangular slug plate. All are tooled; either having a cork or a Riley patent inside thread closure which utilized an ebonite threaded stopper. A number of years ago, I was contacted by a digger in Burlington Vt. 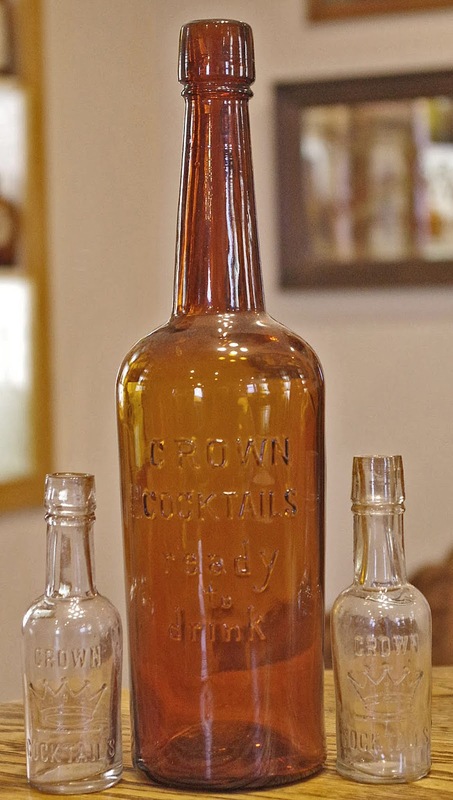 He and a friend had excavated a railroad depot outhouse, and had recovered a clear mini embossed "Crown Cocktails". It had a five point crown embossed on it with jewels on the tip of each crown point. I'd not heard of it before but when he sent me a photo of it, and I compared the photo to the Crown Distilleries label and the embossing on a Crown fifth, it became immediately evident that it was indeed was a Crown Distilleries product, and was a "mini me" version of the amber Crown Cocktails fifth. Wow, not only had a "new" western whiskey made its appearance, but it was a mini "picture" as well! I can just imagine someone boarding a Southern Pacific train in Oakland, making the transcontinental trip to the eastern seaboard, toasting his arrival home with a Crown Cocktail and unceremoniously pitching the empty under the seat as he disembarks the train in Vermont.